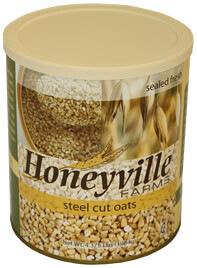 Honeyville's Steel Cut Oats, also known as Pinhead Oatmeal , have been carefully selected from premium milling quality oats. Steel cut oats are really the best of the best when it come to getting the most out of a whole grain oat. Of all of the varieties of oats on the market (rolled oats, instant oats, quick oats, etc.) steel cut oats are the best choice. Steel cut oats maintain all of the nutrients from the whole grain oat as they are simply whole oat groats that have been cut into small pieces. Steel Cut Oats are a rich source of soluble fiber, protein, and vitamins, as well as other nutrients like selenium, thiamin, phosphorous, and manganese. Just three grams of soluble fiber from oatmeal daily in a diet low in saturated fat and cholesterol may reduce the risk of heart disease. A thirty day regimen of 1 bowl a day of oatmeal will actually aid the body in removal of cholesterol. Steel cut oats are a great way to supplement a diet targeted at maintaining a healthy digestive tract and a healthy heart. For a larger quantity of our delicious Steel Cut Oatmeal, try our 6 can case of Steel Cut Oats. You just can't beat the price or the quality for pinhead oatmeal. For an even larger quantity of our healthy Steelcut Oatmeal, try our bulk, wholesale 50 pound bags of Steel Cut Oats. You get the best possible price by buying in bulk. For a smaller package you can try our Steel Cut Oats in a 2 pound bag. Editor's Notes: I'm always looking for new and different ways to get a healthy breakfast that I can prepare and eat quickly. I think I have a winner with my latest breakfast creation. I take a packet or two of instant oatmeal (wait, it gets much better), and add it to my coffee cup. I then add three tablespoons of Steel Cut Oats and two tablespoons of Freeze Dried Blueberries. I add water and microwave for a minute. The result is a chewy variation on oatmeal that has the great flavor of blueberries and sticks with me for hours. I get the benefits of a whole grain in the Steel Cut Oats along with all of the anti-oxidants in the Freezed Dried Blueberries. It tastes great and starts my day off right. Give it a try and see what you think. Freeze Dried Blueberry is also great in smoothies and you can add dried blueberries to your cereal for an added treat.